VeeAnn Wood was surprised and honored January 21 as she was awarded the 2011 MN Horse Person of the Year. Wood had been nominated by Darla Falk, a long time friend and classmate who is not a horse person at all, but had been keeping track of many of the accomplishments and involvement with horses that VeeAnn had been part of over their 50-plus year friendship. VeeAnn’s son Jay and his wife Jean as well as their son Colin were on hand for the presentation, with Jay even stepping up to the mic to help with the award. Some of the highlights mentioned go back to when VeeAnn’s parents purchased the Minnehaha Park Pony Concession and she worked there for $1/day to help pay for her college education. The ponies were stabled at a farm on 86th and Cedar, which just so happens to be the site of the Mall of America today. The Pony Concessions continued in operation through VeeAnn’s college years until it was sold in 1968. Her next job was as a trail guide at the Minneapolis Park Stables, then located on Park Avenue and Lake Street where the trail rides wound around Lake of the Isles. While still in High School, she was so anxious to immerse herself in ownership, she rented a horse from Shady Valley Stables and kept it in her garage for a whole week, right there on Nicollet Avenue inside the city of Minneapolis. Her folks had told her that if she ever wanted to actually own a horse, she had better go to school and get a good job. She followed their advice and went to the University of Minnesota, receiving her Bachelors in Physical Education and later completing her Master’s in Education. Eventually, her dream of owning a horse of her own came true as she spent her hard earned money for a half-Morgan gelding named Black Shadow, followed shortly by her purchase of a nice grey quarter horse mare named Jewel. Both horses were very well trained and introduced VeeAnn to the wonderful world of horse shows. For several years her method of getting to the barn was via the Richfield bus company and that particular bus route happened to have a handsome bus driver who took a fancy to VeeAnn. They got to talking about her horses and a true friendship was born. The driver soon realized that if he was going to capture the heart of this special young lady, he had better become a horseman himself. That bus driver, Ernie Wood Senior, would eventually learn to love horses himself and share many years with VeeAnn and her love for horses. Ernie became a graduate of Michigan State University Horse Shoeing School and the two were married in 1960. VeeAnn’s two horses were kept in a pasture on a farm, owned by Dave and Marianne Naas. One morning she went to the farm to ride her horses only to find both of them had been struck and killed by lightning. She was devastated and in spite of yearning for ownership for so many years was ready to give up on horses. Luckily, the Naas family had a typey black Morgan show mare, who had just had her first colt, a beautiful black stallion named Congodon that they insisted that she purchase. In 1968, VeeAnn’s family sold the pony business and she and Ernie land in Plato, Minnesota where Westwood Farm was born and still stands today. VeeAnn and Ernie had two boys, Jay and Westin, and both were exposed to horses at a very early age, making their leadline debuts well before we were a year old. The Woods soon built an indoor arena, started training, giving lessons and introduced many new people to the joys of both riding and driving horses. Many of these people are still enjoying this great sport even today. Good friend, Art Perry, invited her to ride in the American Morgan Horse Unit of the 1982 Rose Bowl Parade. 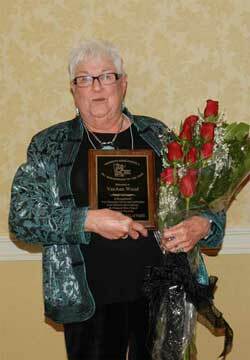 WSCA judge for almost 40 years and was recently honored by WSCA recently for her many years of service. Board member of We Can Ride, Inc Therapeutic Riding program where she also serves as chair of The Equine Management Committee focusing on the care, training, and the acquisition of the therapeutic horses used in the program. Received the Lois Shultz Award for her commitment to We Can Ride and her outstanding volunteer work of helping people with disabilities enjoy the wonderful world of horses. Serving on the MN Horse Council Scholarship Committee for nearly a dozen years. Tri-State Horseman’s Board of Directors for many years, receiving their Lifetime Achievement Award in 2006. Charter member of North Central Morgan Association and served several terms as board member and executive officer. Co-chairman of Northstar Morgan Americana Horse Show on more than one occasion. 4-H judge since 1973, serving as advisor for the McLeod County Judging Team. Served on the 4-H Judges Advisory Committee. Involved with charity functions such as Charity Night for Children’s Hospital. For Several years she would take a horse to the Children’s Hospital where she would let the sick kids have an opportunity to pet and feed carrots to the horse. Sponsor and promote a dedicated night at the Northstar Morgan Americana Horse show to benefit the Children’s Hospital. For many years, VeeAnn has been exhibiting horses at the MN State Fairgrounds where the prior recipients of this award are on display. Her late husband, Ernie Wood was honored as the 1991 Horse person of the Year and she often smiles as she sees his photo on this wall of fame. VeeAnn continues to dedicate her life to the promotion of the horse and the horse world in spite of several personal setbacks including losing her husband Ernie in 1990, having her son Westen be involved in a major automobile accident six months later which left him incapacitated until 1998 when he then joined Ernie. Recent health problems including an extended hospitalization requiring treatments for a number of complications followed by eye surgery and knee replacements have not slowed this woman down. These seem to be mere bumps in the road and she bounces back like the energizer bunny. She is already looking forward to the 2012 show season and is ready to show and of course to continue her many judging assignments. VeeAnn has been a true ambassador of the horse world and is well respected by her peers as an owner, trainer, judge, exhibitor and volunteer and most of all a friend to all, for over 50 years.